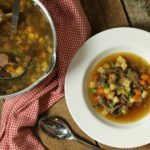 Oxtail soup is a wonderfully rich, meaty recipe loaded with hearty vegetables, and tender meat. 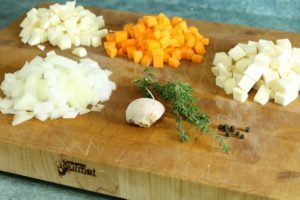 The perfect meal to warm up with on a cold windy day, this hearty soup is usually served as a broth style soup with varying garnishes. 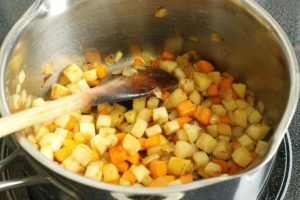 You can also ‘bind’ the soup with a flour or cornstarch slurry, creating a creamy stew-like recipe. 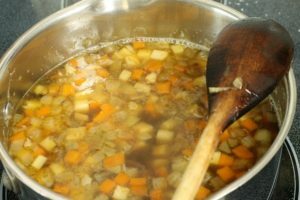 The ‘clear broth’ variation is the one I grew up with, and is quite popular in Germany around Christmas, and served at special occasions such as weddings. When most people first hear the word ‘oxtail’ they immediately think “EWWW! !” , though that couldn’t be farther from the truth. Oxtail is the actual, skinned and sectioned tail of a steer (a male neutered cow), and is extremely rich in gelatin due to it’s high ratio of connective tissue to bone and meat. 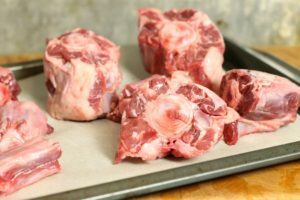 This makes oxtail ideal for braising or stewing, as the long, slow cooking process help break down all that connective tissue, and tenderizes what little meat there is. What Does Oxtail Taste Like? Oxtail recipes are generally quite rich in flavor, and very similar in flavor to other beef dishes, especially short ribs. If you like beef gravy, you’ll love oxtail! 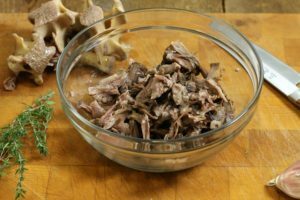 The richness comes from the marrow in the bone, fat, and other connective tissues that are broken down as the oxtail is slowly braised, releasing all their flavor and healthy goodies into the individual recipes. Because oxtail itself does not contain much meat, (each section of tail only has 6 or 7 small nuggets of meat on it), oxtail is most often turned into soup or stew, where the long cooking times take advantage of drawing out as much flavor and nutrition as possible. The tail bones can be roasted first to intensify their flavor, and then stewed or braised. After cooking the meat is removed from the bones and added back into the oxtail soup or stew. Despite oxtail having a fairly high fat content compared to other meats, it is very rich in iron, and a great source of collagen which is good for you skin and joints! I remember vising family in Germany with my wife, and going to a little local restaurant in Bad Zwischenahn which is in the North of Germany in Oldenburg. It was a cold and windy day, and we had stopped to get lunch at a local restaurant. My wife, (who at the time was much more conservative then she is now with her food choices), was cold and starving, and my father immediately suggested she order the Ochsenschwanz Suppe. Of course she asked what that was, and when we explained it to her she said ‘No Thank You’, and I must say I think was put of by the idea of eating an Ox’s tail! Nevertheless with a little convincing she agreed to try it, and did she ever love the soup when it did come! 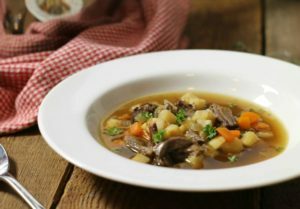 Served with some hearty sourdough bread, the rich, brothy soup was just what she needed to warm up! 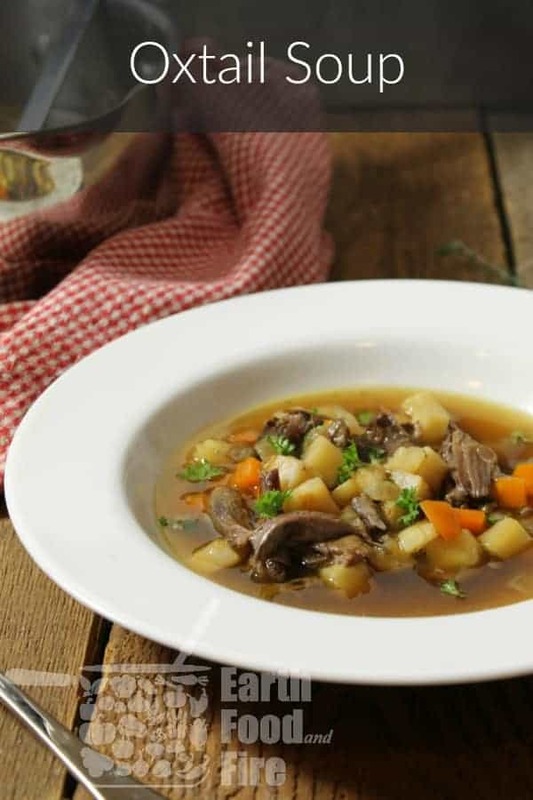 This recipe is reminiscent of that lunch, a rich brothy soup, loaded with hearty vegetables, oxtail meat, and herbs. I hope you enjoy it as much as my wife did! The Oxtail Soup is made in two parts. First the broth is made by roasting the bones, and then simmering them with some of the root vegetables and wine. Very similar to making a beef stock, but with more flavorings. Once the broth has been made, the meat is picked of the oxtail bones, and diced vegetable garnishes are cooked and added to the soup with fresh herbs. This prevents the vegetables in the finished soup from breaking down during the long cooking process the oxtail broth requires. Start by roasting the oxtail bones on a sheet pan at 375F for 20 to 30 minutes or until they are dark brown, and start to ‘sear’ on around the edges. Toss the bones in oil and season them with a little salt and pepper to help develop the flavor of the meat as it roasts. As the meat roasts, peel and rough chop the broth vegetables. This doesn’t need to be pretty, they will simply add flavor to the oxtail broth, and are discarded once the broth is finished. 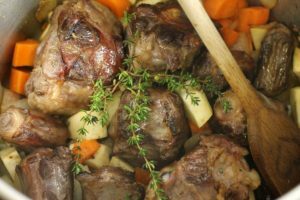 Once the oxtail bones are roasted, combine them with the chopped vegetables, thyme, garlic, bay leaf, peppercorns, red wine, and water. Place everything in a large pot and slowly bring the broth to a simmer. To achieve a crystal clear broth, start with cold water, and never let the liquid boil! Slowly let the oxtail broth simmer for about 4 hours. 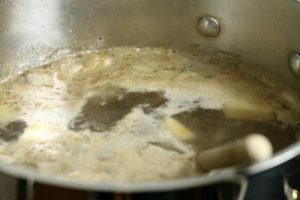 As the broth simmers you’ll notice a white foam start to form on top of the liquid. 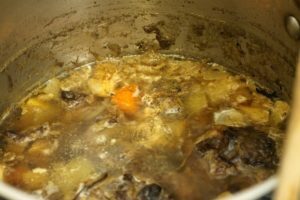 This is normal and is caused by impurities such as blood, and other minerals as they are drawn out of the oxtail and vegetables. Skim this off to get a clear broth. Keep an eye on the oxtail broth as it simmers to prevent it from boiling, it should just bubble along happily on the stove. Taste the broth occasionally to see how the flavor is developing, it should be rich and beefy. Once the broth has a rich taste, you can safely turn the pot off. Strain the oxtail broth from the pot, and set aside the oxtail bones themselves. These can be picked out with a spoon or tongs. I like using a fine mesh strainer (affiliate link) to separate the broth from the oxtail bones and vegetables, to catch even the smallest solids. The vegetables can be discarded. Pick the meat of the oxtail, and reserve it for later. Picking the oxtail meat of the bones while still warm is easiest, as the meat will fall right of the bone. The broth can be cooled or kept warm if you plan on finishing the soup right away. If you cool the broth, the fat will rise to the top and solidify. This can be skimmed of and discarded as well. If you don’t cool the broth, just continue with the instructions below. While the oxtail broth is simmering, medium dice the vegetable garnishes, and chop the herbs. Saute the vegetables in a pot with a little butter or oil, until they start to brown slightly. Add the garlic and herb and cook for another minute or two. You’ll notice theroot vegetables start to stick to the bottom as the naturally present sugars start to caramelize. At this point you should add the wine to de-glaze the pot. Add the oxtail broth, and picked oxtail meat to the soup. Bring the oxtail soup to a simmer and cook for another 30 minutes. Taste the oxtail soup and season it with salt and pepper. I’ve even used soy sauce to season soups and add a touch of extra flavor! The oxtail soup can be served right away, or refrigerated and kept for up to a week. It makes a quick weeknight meal, re-heated on the stove top! 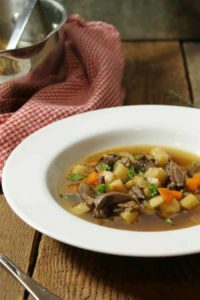 A rich and hearty broth based oxtail soup, ideal for warming up during cold weather. 1 splash Port Wine Red wine will do in a pinch! Toss the bones in oil and season them with a little salt and pepper. Roast the oxtail bones on a sheet pan at 375F for 20 to 30 minutes or until they are dark brown, and start to 'sear' on around the edges. As the meat roasts, peel and rough chop the broth vegetables. This doesn't need to be pretty, they will simply add flavor to the oxtail broth, and are discarded once the broth is finished. Once the oxtail bones are roasted, combine them with the chopped vegetables, thyme, garlic, bay leaf, peppercorns, red wine, and water. Place everything in a large pot and slowly bring the broth to a simmer. Slowly let the oxtail broth simmer for about 4 hours. As the broth simmers you'll notice a white foam start to form on top of the liquid, skim it off as it forms. Once the broth has a rich taste (after about 4 hours), you can safely turn the pot off. Strain the oxtail broth from the pot, and set aside the oxtail bones themselves. Pick the meat of the oxtail, and reserve it for later. The broth can be cooled or kept warm if you plan on finishing the soup right away. Add the garlic and herb and cook for another minute or two. Once the vegetables start to brown, add the wine to de-glaze the pot. Add the oxtail broth, and picked oxtail meat to the pot. Bring the oxtail soup to a simmer and cook for another 30 minutes. Taste the oxtail soup and season it with salt and pepper. Serve hot. The oxtail soup can be served right away, or refrigerated and kept for up to a week. It makes a quick weeknight meal, re-heated on the stove top! Markus this soup sounds beautiful rich and hearty. Absolutely perfect for this weather and the coming winter. Thank you for sharing. You’re welcome Kristen! I hope you enjoy it! I’ve never tried oxtail but sounds like I should! And on a cold and rainy day like today, how can I turn down a warm and cozy bowl of soup?! I know! It really is ideal in cold, rainy weather. I am actually heating a leftover bowl of it as I type this! I’ve never cooked, or even tasted, Ox tail soup. Your post makes it sound intriguing, and the pics look delicious. Thanks for the education on this ingredient, Markus! I love oxtail soup but I haven’t had it in such a long time. Your recipe looks delicious and easy! Now to find oxtails and make it asap! If you ask a local butcher, I am sure they can source some for you! Haven’t cooked a dish with oxtail before, but this made me want to try it. Looks so delish! I do hope you try it!, It really is quite delicious! This is the best time of year for homemade soup. So tasty and comforting. I’m definitely in the “ewww” crown but not based on taste. I’m just one of those people. My fiance is the complete opposite though and he will love this – passing it along to him now! I know what you mean, the thought of eating a tail can be odd! But once you try the soup I am sure you will be convinced! What a beautiful recipe! I’m definitely not one to say “ewwww” at oxtail, but I live in wine country and the local restaurants have made me a believer. I’ve never tried cooking with it and your recipe makes me want to give it a go! Thanks for sharing with us! You’re welcome Traci, It does take a bit of work, picking the meat of the bones after braising, but it’s well worth the effort.